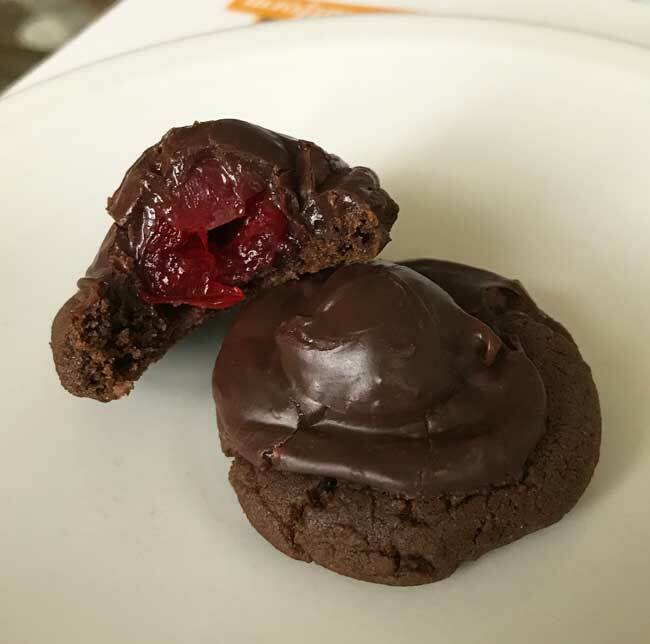 I’ve been making Chocolate Covered Cherry Cookies for years. Not only are they delicious and unique, but they’re a good way to use up partial cans of condensed milk. If you’re opening a fresh can of condensed milk just to make these cookies, I suggest using the second half of the can for a half batch (8 inch square) pan of Magic Cookie Bars, so keep that in mind. I don’t think you’ll want to double this recipe because it is very tedious and it does not double well. 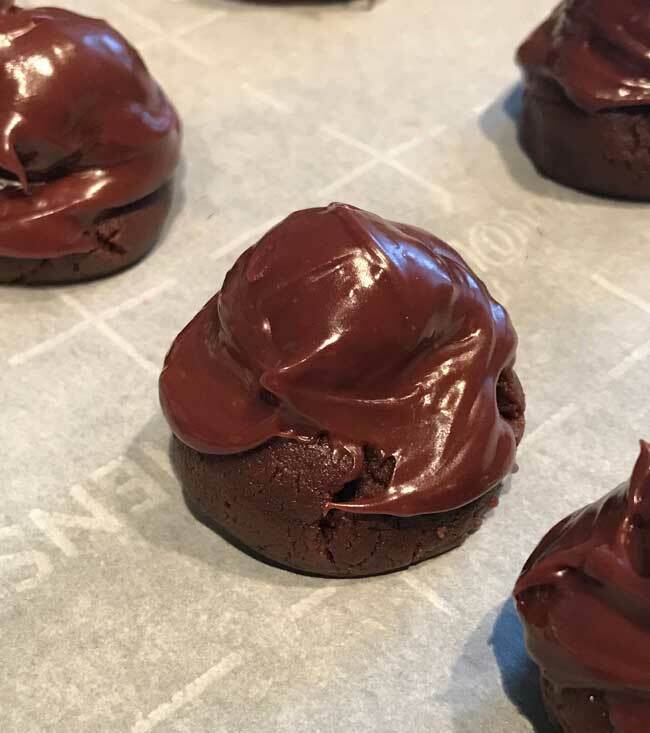 Back when I first attempted Chocolate Covered Cherry Cookies, I made the cookie dough balls a bit larger than they are supposed to be and had a higher ratio of dough to cherry and chocolate. The correct way to make these is with a very small cookie base (you should get 48 balls) with a whole cherry on top and generous spoon of fudge mixture. Unfortunately, the dough is very thick so molding the little balls takes some time. Also, you’ll need 48 cherries. The original recipe called for one jar, but one jar doesn’t contain 48 cherries so you’ll need two jars. 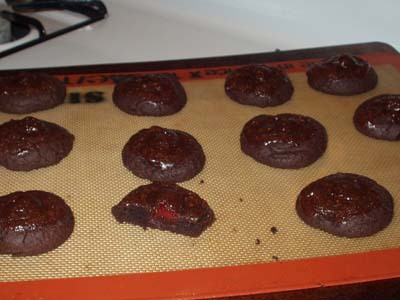 Chocolate Covered Cherry Cookies are a cookie version of the popular candy. They're also a good way to use up condensed milk leftover from other recipes. In a bowl, combine flour and cocoa. Set aside. In a large mixing bowl, beat butter with an electric mixer at medium speed for about 30 seconds or until softened. Add sugar, salt, baking powder and baking soda and continue beating until well combined.Add egg and vanilla and beat well. Stir in the flour mixture being careful not to over-beat. Shape dough into 1-inch balls; place on ungreased baking sheet. Press down center of each ball with thumb. Drain maraschino cherries, reserving juice. Place a cherry in the center of each cookie. In a small saucepan combine the chocolate pieces and sweetened condensed milk. Heat until chocolate is melted. Stir in 4 teaspoons of the reserved cherry juice. Spoon about 1 tsp of the chocolate mixture over each cherry on unbaked, spreading to cover cherry. Bake in preheated oven set to 350° for about 10 minutes or until done. Remove to wire rack and cool. Cover and store at room temperature up to two days. The mixing technique for these is a little strange, with the baking powder and baking soda added to the creamed mixture rather than the flour mixture. Adding them to the more fluid batter (that is, before the flour is added) ensures they are more evenly distributed.